Using a Food Processor pulse everything but maple syrup until it forms a thick dough. Then, slowly drizzle the maple syrup until fully blended. Using a spatula, place the batter on a wax paper lined large plate or a glass container. Freeze. Remove and cut into desired size. Store in the refrigerator. Bamm.. fudge in 5 blissful minutes! 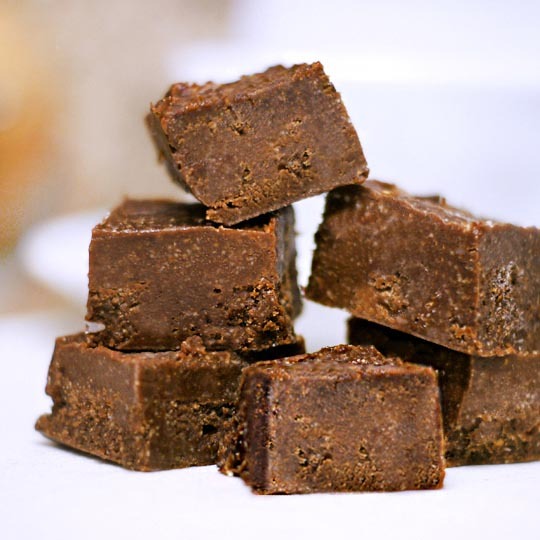 This is one of my favorite recipes for fudge as it is quick and simple with minimal healthy ingredients. To be honest, I usually find a great hiding spot in the back of the refrigerator and save it all for myself. Opps! Yeah, it’s that good! Macadamia Nuts are nutritional powerhouse with a rich buttery crunch. High in monounsaturated fats, which assist in healthy cholesterol levels. Great source of protein and amino acids, and fiber. Also contain important antioxidants, such as vitamin E and selenium, and other phytonutrients.